In the early 1980’s when skylights, sunrooms and solariums became popular the only glass options were single pane, double pane, or insulated glass. Unfortunately, even though attractive, this type of glass did not allow spaces to be heated or cooled very effectively. Glass technology has made great advances since the 80’s. 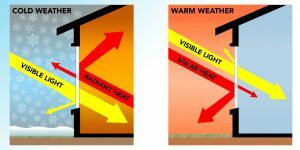 Spaces with skylights and even solariums today allow nearly the same efficient heating and cooling as any other space in the building. Our SilverCoat E-366 and Solarban 70XL is the best value in glass available. It’s manufactured specially for Crystal Structures by Cardinal Glass, one of the premier glass manufacturing and coating companies in the world. Our Solarban 70XL is made by Vitro (PPG) and is considered equal to SilverCoat E-366. Based upon availability and logistics of the project we may elect to use Solarban 70XL in place of SilverCoat E-366 – both are high performance glass options. Clear insulated glass gives a clear view inside and out. Many other low-e coatings are available from Pilkington, Guardian, Old Castle and Viracon. On commercial projects, federal codes require all roof glass to be laminated. Our standard laminated glass can be combined with any of the glass above. Our standard inboard laminate glass is 1/4″ heat strengthened with an 0.60 PVB inner layer. Most of our competitors use a 1/4″ annealed glass with only 0.30 inner layer.